July is not only the hottest month of the year in the United States; it’s also UV Safety Month. This month is about helping adults and parents learn about the best ways to stay safe from harmful UV rays. What you might not know is that skin is an organ – and it’s the largest one. Skin plays an important role in keeping bacteria out of the body, minimizing water loss and regulating body temperature. When anyone – adults or children – spends too much time in the sun, the overexposure can cause serious damage to the skin, age spots, wrinkles and even increase the risk of skin cancer. One of the challenges of keeping your skin healthy is finding the right sunscreens to use. Your choices aren’t only plentiful, they can also be confusing. According to the Food and Drug Administration’s 2015 regulations, sunscreens that pass the broad spectrum test will provide protection against both ultraviolet B radiation (UVB) and ultraviolet A radiation (UVA). Sunburn is primarily caused by UVB, although both UVB and UVA can cause sunburn, skin cancer, and premature skin aging. Under the new regulations, sunscreen products that protect against all types of sun-induced skin damage will be labeled “Broad Spectrum” and “SPF 15” (or higher) on the front. However, just because you’re trying to protect children doesn’t mean you need to use a children’s sunscreen. 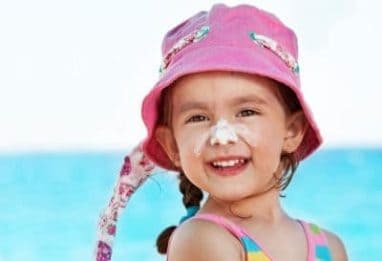 Consumer Reports says that the FDA doesn’t make the distinction between kids’ sunscreen and other types of sunscreens. It also doesn’t hold kids’ sunscreen to higher safety standard because it’s for kids. According to the Environmental Working Group, several popular chemicals used in many sunscreens can pose problems if inhaled or if it penetrates the skin to reach living tissue. Mineral-based sunscreens can offer protection with fewer harsh ingredients. Who wants to bother with health reminders before spending a fun day at the beach in the middle of summer? Unfortunately, the reminders really are for your protection. During UV Safety Month, take a moment to learn more about the health risks of UV light and about ways to protect your skin and eyes. Check the UV index in your area before going outside. This tool from the EPA can help you prepare better if you’re spending a day in the sun. The sun is most intense from 10 a.m. until 4 p.m. It’s best to avoid being in full sun for too long during these hours. Experts recommend wearing sun protection such as long sleeves, sunglasses and sunscreen, even when it’s cloudy. UV light can still pass through clouds and haze. If you are outside on the water or near windows, you are at risk of getting sunburned: These surfaces can reflect more UV rays onto you. Use broad-spectrum sunscreen with a SPF of between 30 and 50. Make sure you apply it 15 minutes before heading outside and reapply it every two hours, especially when swimming. You can still get sunburned in winter, especially when it’s sunny and reflecting off the snow. If you are skiing, snowboarding, tubing, or just playing outside, take caution. Overexposure to UV light can also have negative effects on your eyes. UV light can increase your risk of eye conditions such as cataracts, growths and cancer in the eye. You also have to check your sunglasses carefully because all are not created equally. Make sure to only buy sunglasses labeled “UV400” or “100 percent UV protection.” Darker lenses don’t always mean better protection. Make-A-Wish chapters around the country are dedicated to help children with life-threating medical conditions. If you want to help their goal of granting wishes, please consider making a car donation to Wheels For Wishes, the car donation program benefiting Make-A-Wish. We offer you a great tax deduction, free towing and an easy way to support an important cause. To donate your car, boat, RV, motorcycle or other vehicles, please call 1-877-431-9474 or fill out our online car donation form.